We recently had a booth set up at the National Space Symposium. We are usually the only artists that have a booth - the anomaly. 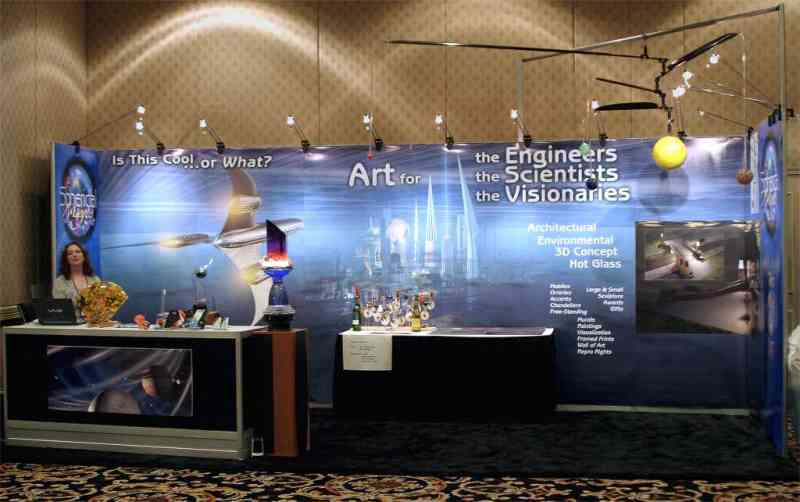 We do a lot of work for the Space Foundation, which runs the symposium, including moving the large sculpture that goes on display for this symposium, so we have an exhibit in the hall during the week while we're taking care of their big glass sculpture. So we set up our booth. As you can see, we have big space art (or SF art perhaps) on the back panel. We also have space art on the front of the display cabinet. We have a large solar system mobile hanging from the sky. We have some of our awards displayed - Lifetime Achievement for both Space Foundation, and the United States Geospatial Intelligence Foundation. The back table has our portfolio with 48 images of space art, and of course, the huge back panel says ART on it. 1. "What do you do?" --- Uhhh..... can you read the 18 inch tall letters on this panel here? ART? It has taken me numerous years to come up with some sort of answer that doesn't beg to have " , bonehead" attached to the end of it. So I detail out what we do - "Illustration, Spaceflight Mission artwork, Concept art, and also Glass Sculptures  large for corporate lobbies, but also smaller for gifts, and awards." 2. "What does this have to do with Space?"  wow... ummm and again, the "bonehead" word leaps into my mind as I look around the booth at EVERYTHING being Space related. This year, I came up with this response. Tell me what you think. Is it just me? Am I in an alternate universe? Can people really not make the leap that other types of businesses can be involved in what their own focus is? Is that it? They are just so narrowly focused on their own little piece of the space industry that they can't widen their scope for even an instant? We get these questions multiple times every day of the conference, every year. I should say I expect it now, but each time it happens, it still stuns me and I have to pick my chin up off the table before I can answer. What would you say? Do these questions make sense to begin with? Am I too narrowly focused on my own? Are they clueless, or is it just me? 8 Responses to: Clueless People? Or Is It Just Me?? Hi Joy, You know I get this too. I think people are really trying to put your particular kind of art into a defined category and so they ask, "What do you do?" They also mean to ask about your media. Today after church, with my liturgical banners filling the chapel, people asked, "What do you do?" So I tell them about the variety of digital graphics and art that I do including fabric art. Sometimes folks just don't know what kind of questions to ask so it is the most general, "What do you do?" that they ask. Your asnswers were great. I think you could have a small sign that says, "This is what we do" and then give your definitions as you did in the Blog. Nice diplay by the way. Pretty soon you'll need a moving van just for the display--if you don't already use a van. This is true, really, for any type of show. I could be standing next to a big ole computer with a big sign above it "The Best Data Warehousing Platform in the industry" and they still ask what it does. When you say "It does your payroll 20% faster and saves you money" they go "oohhh..."
Highlighting the final end product and why that's goodness for them is about the only way to go to cut down on the cluelessness. And yet, they will still seek clues. Julie, Yes, I don't mind in the slightest if I get the "What do you do?" at a dinner or a party or whatever, but when they've been standing at the booth, staring at it, looking completely dumbfounded for several *minutes* and then ask.... That's when my eyes start to roll. what really bugs me is the condescending tone that accompanies these two questions -- Like we're something completely unrelated that just happened to be stupid enough to stumble into a space exhibit. Like we're selling baby furniture or Christian CDs or something. I should make up a sign with a cartoon text bubble and when they ask, I just hold it up over my head, like Weird Al. Hi Joy... Art is just simply out of the box for most people. They think they are there to be entertained, so the brain is just not engaged. Many folks just don't think art has a use or purpose until they need some, then they don't value it because it is such an after thought. We did it to ourselves as a culture - art is the first school program to be cut. After all, it's not really a CAREER, now is it? Nor is it particularly important... I mean KIDS do art, not rational adults, right? Except those "frilly, pinko, artsy types... this is even more true for men BTW - men shouldn't be wasting their time when they could be doing SPORTS. Sigh. Our society just doesn't get the importance, despite how saturated we are with it. You would think even the average Joe Sixpack could make the connection between ads, marketing, design plans and TV commercials... and ART. Not so. Sad but true. We all have this particular cross to bear, as artists. I mean to say! I think one could make the case that without the likes of Bonestall's painting in Colliers we would HAVE a space program! Here's your chance to give people a clue. like you say in your rant about education, many people _don't_ know art is a profession. I'd think this question is why you're there, instead of at the World Science Fiction Convention. If the question is giving you burnout, you could arrange a little video for them to see, just direct em to the portfolio, or bring along a talented kid who wants to learn what you do [no trouble to find such a one!] and let the youngster answer the question. But maybe this is not why you're there. Maybe you're just an advertisement for your services, tired to the point of anger being mistaken for an educational exhibit. "Clueless People?" you ask "Or is it me?" The answer is yes. Both. Jay, You're quite right. Most people do NOT know that art is a profession. They believe we're doing it for the fun of it, not that we actually strive to make a living by it. It seems like we're not an educational exhibit, but a sideshow. An anomaly. It just gets so frustrating that we're not seen as having any use. If the question was sincere wondering how we relate, that's one thing, but it's usually with a snide "oh look, the cute little artists wandered into the adult peoples show by mistake" tone, which is what really torques my chickens. As to why we're not at SF cons, we show our stuff there occasionally, but the big space industry companies are our market - we build huge installations for them. An SF con attendee is not going to purchase a $75,000 mobile. Heck, they rarely purchase a $60 print! You have a very good suggestion though, in that we should have a little area that explains why we relate and we can direct them to that, leaving us free to engage the people that DO understand and are interested in our services. I get the same kinds of questions when I am selling glass lampwork beads, even at bead shows. "How do you get the hole in the bead?" "Can you change the color of this particular bead for me?" "I dropped my bead/bracelet/fan pull/etc. on the concrete and it broke." (ummm, what part of made fo GLASS do you not get ... ?" "Why are these more expensive / not exactly uniform than the ones I bought at Michael's?" My business partner and I saw these as an opportunity to educate people about small crafters, glass working in general, and the like. We have handouts, a sign in plexiglas about buying from artisans rather than buying beads made in sweatshop conditions, etc. It's a pity that you're getting the sort of condescending remarks you do, though. I do think people tend to associate art as "craft" defined by preschool ideas of craft. You know, what Mom does in her "spare time" for fun. Craft tends to be gendered female, art--which is museum quality and not at trade shows--is male. *eyeroll* So when people with that sort of vague notion see your booth, it is "craft" and therefore "out of place" at a "serious event." Good luck educating people! Let us know if the next show is better!